ANAHEIM, Calif. (AP) — Howie Kendrick had a two-run single in his first game batting leadoff this season, Chris Iannetta hit a pair of RBI singles and the Los Angeles Angels beat Cleveland 6-4 Tuesday night, sending the Indians to their fifth straight defeat. 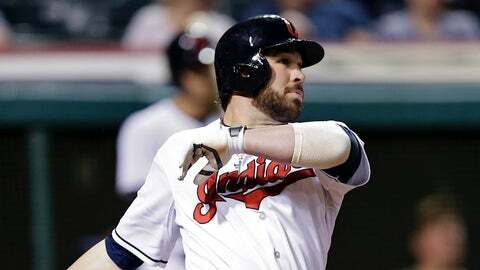 Cleveland also lost All-Star second baseman Jason Kipnis to an abdominal strain in the fourth inning. Jered Weaver (2-2) allowed two runs and eight hits in 5 1-3 innings, striking out six and walking one. The Angels’ ace threw 90 pitches and was lifted after giving up four consecutive hits, including a two-run homer by Carlos Santana. Joe Smith, the seventh Angels pitcher, tossed a perfect ninth for his second save in two nights against his former teammates after he was thrust into the closer’s role last Friday in place of an ineffective Ernesto Frieri. Corey Kluber (2-3) gave up four runs — three earned — and four hits over 4 2-3 innings with five strikeouts and four walks. The right-hander escaped a bases-loaded jam in the fourth, retiring Albert Pujols on a popup after an intentional walk to Mike Trout and then striking out Raul Ibanez with the Indians trailing 2-0. The Angels put runners at the corners in the fifth with the help of a successful replay challenge by manager Mike Scioscia, after first base umpire Gabe Morales ruled J.B. Shuck out on a potential double-play grounder to second base that was corrected to a fielder’s choice. Shuck stole second, and Kendrick chased Kluber with a two-run single to center for a 4-0 lead after a walk to Collin Cowgill. That was the only official at-bat for the Angels’ second baseman, who got plunked by Kluber’s second pitch of the game, had a sacrifice bunt in the fourth and walked in the seventh. Kendrick became the fifth player Scioscia has started in the leadoff spot. It was the 12th time Kendrick has started there in his nine-year career, the rest coming in 2010. He is 13 for 47 with two homers, 10 RBIs, four walks and eight runs scored when starting atop the lineup, and the Angels are 9-3 in those games. Santana, who hit a three-run homer in Monday night’s series-opening 6-3 loss, got the Indians off the mat in the sixth with his two-run shot to right field after a single by Mike Aviles. Michael Brantley then snapped an 0-for-17 drought with a double and went to third on a single by Asdrubal Cabrera that chased Weaver. But Michael Kohn struck out Yan Gomes with the bases loaded after a two-out walk to David Murphy and a visit from pitching coach Mike Butcher. Yoslan Herrera gave way to Nick Maronde with the bases loaded and none out in the Cleveland seventh, and Santana drew a four-pitch walk that forced home a run. Brantley followed with a sacrifice fly that cut the Angels’ lead to 5-4 and brought in Kevin Jepsen, who struck out Cabrera and retired Jason Giambi on a deep fly. Aviles took over at second base in the fourth for Kipnis, who left with an abdominal strain on his right side after grounding into a double play. 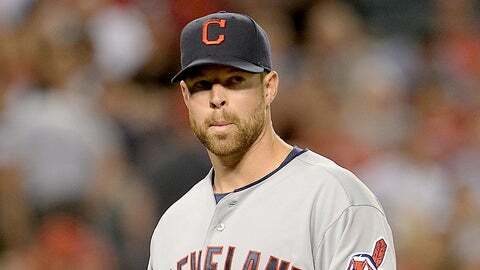 NOTES: Ibanez was the only player on the Angels’ roster that Kluber had faced before. … Shuck ended a career-worst 0-for-22 drought with a hit-and-run single in the fourth. … Weaver has pitched 873 innings and faced 3,492 batters since his last intentional walk on Sept. 4, 2009, at Kansas City. … Cabrera and Santana had two-out bunt singles in the second and fourth, respectively. … The Indians demoted Wednesday’s scheduled starter, RHP Carlos Carrasco, to the bullpen with an 0-3 record and a 6.95 ERA in four outings. RHP Zach McAllister will start on three days’ rest for the first time in his career after throwing 75 pitches over five innings Saturday in a loss at San Francisco.